After last year’s mega box office hit Operation Red Sea <紅海行動>, director Dante Lam (林超賢) follows up with another ambitious film, The Rescue <緊急救援>, which boasts an even bigger budget and more gripping action scenes. Centered around a team of maritime rescue workers, The Rescue released a teaser trailer at today’s FILMART 2019 expo for the Hong Kong film and television industries. 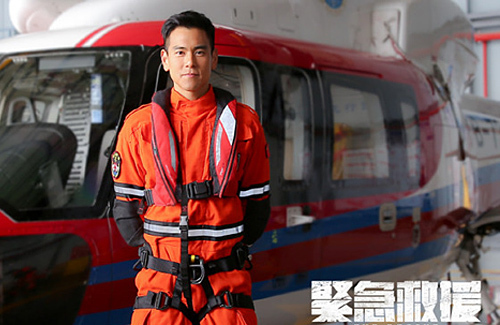 In the one-minute trailer, Eddie Peng (彭于晏) along with his rescue team members were seen facing dangerous explosions and diving from helicopters to perform their rescue missions. Similar to Operation Red Sea, The Rescue explores themes of heroic self-sacrifice. For Eddie Peng, this is the fourth time he has worked with Dante Lam. Familiar with Dante’s rigorous demands and the physical stamina required to make his films, Eddie was thrilled to have another opportunity to acquire new skills and learn from the director.